HomeClassic Country SinglesEddy Arnold, "Make the World Go Away"
Eddy Arnold, "Make the World Go Away"
When Carrie Underwood and Brad Paisley honored the memory of Eddy Arnold at the 2008 ACM Awards, they did so by performing his classic hit, “Make the World Go Away.” Arnold is the most successful singles artist in country music history, but even among his deep catalog of timeless hits, “Make the World Go Away” was his signature tune. What's amazing is that Arnold wasn't even the first artist to have a hit with the song. Hank Cochran had already established himself as one of Nashville's top songwriters by the time he wrote “Make the World Go Away.” It was only fitting that he would offer his stellar new song to an A-list artist, which in 1963, meant Ray Price, not Eddy Arnold. Price took the song to No. 2 on the country charts in 1963, and it dented the pop charts, peaking at No. 100.
d”, his first No. 1 hit in ten years. This led to the album My World, which was anchored by that hit single. Releasing multiple songs from one album was still a rarity in that era, but RCA sensed that the album housed another hit: “I'm Letting You Go.” However, the song stalled at No. 15 on the country chart. Conventional wisdom would've suggested moving on to the next set, not releasing a cover of a hit from two years ago, but RCA sent out “Make the World Go Away” anyway, and it was a smash. It topped the country singles chart, was a top ten pop hit, and helped make My World Arnold's first gold album. In the wake of the song's success, Arnold was inducted into the Country Music Hall of Fame and named the very first CMA Entertainer of the Year. Arnold's version of “Make the World Go Away” became a standard, even though he was the third artist to have a hit with it. The sweeping strings were a perfect match for his pure vocal, a definitive example of the Nashville Sound done right. 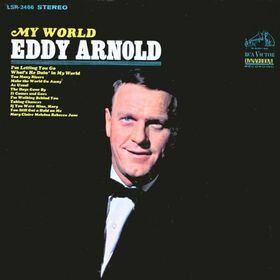 Though the song has also been recorded by Elvis Presley, Englebert Humperdink, Donny & Marie Osmond and Martina McBride, it is Arnold's recording of the song that is in the Grammy Hall of Fame, the most significant single in a career full of classics. Yes, for many non-country fans, “Make The World Go Away” is the song that they most associate with Eddy, as it reached #8 on the Billboard Hot 100 pop singles chart in November 1965. And this was at a time when the pop charts were dominated in large part by the Beatles and the rest of the British Invasion, so for any country artist to have that big a hit at that time was something of a big deal. I don’t think many fans who grew up with Arnold’s music would regard “Make The World Go Away” as his signature song. Eddy had so many big hits that it would be hard to think of any one song as being a signature song and “Make The World Go Away” was far from being his biggest hit. For most of my generation either “Cattle Call” or “Just A Little Lovin’ ” would fit the bill better.